Wow! Talk about failing on an epic level. 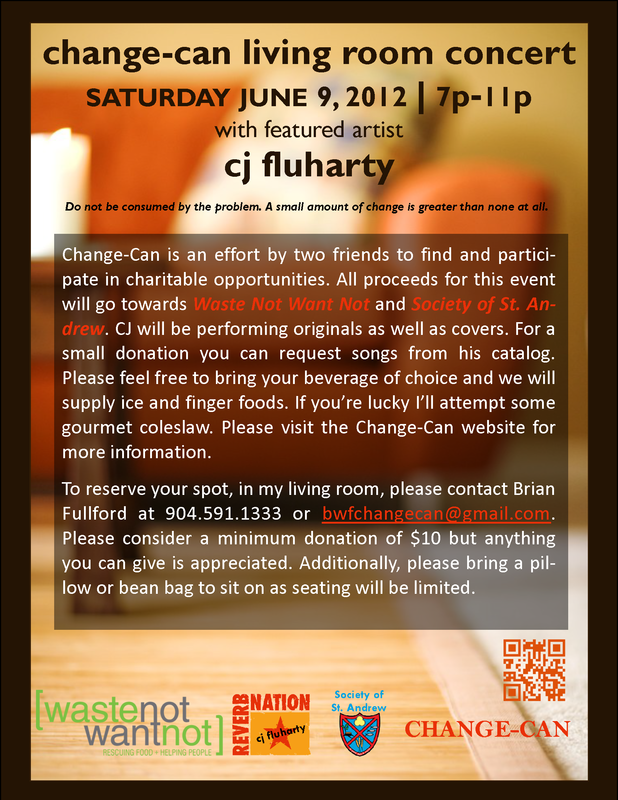 On June 9th of this year my goal of hosting a living room concert for any charity was realized. Looking back on the event the process was much easier than expected and credit directed towards me seems greatly misguided. But managing anything is never easy and what I discovered was that people really like to help you when you are doing something good. C. J. Fluharty was the perfect entertainer. His knack for being your friend at first contact is a thing to behold. The musical selection, which was a mixture of original songs and audience requests, carried us through a range of emotions and stages in our personal lives. Presently he is attending Jacksonville University in pursuit of a music degree, a direction which after that Saturday night is an obvious logical progression. The representatives of our respective charities, Sandi Newman for Society of St. Andrew and Sandra L. Staudt-Killea of Waste Not Want Not, brought more than enough information to hopefully allow the attendees to understand what they do and how it helps. While all those volunteering their free time to make this a reputable event can never be thanked enough it was my friends who really humbled me. The safest way to ensure attendance is to ask those you know to show up. With no budget to market anything (thank you again Tina Greeley for creating the flyer) all hope was invested in my social circle. They showed up and then some. An event is nothing without food and drinks. The decision was that the host would facilitate sustance. When asking folks for money the least you can do is feed them. But as the people rolled in also came the trays of edible delights. Vicki Poole’s grape salad to Chris Gandy’s quinoa salad, the kitchen began to fill and by night’s end Sandi and Sandra not only praised C. J. but also the food variety. Sadly I was so busy I did not get a chance to document the spread because I am sure there were recipes worth sharing. When the donations were totaled the change cans had been filled to the sum of $840.00. With my employers matching gift that meant each charity received the amount donated from the concert. Chris Gandy made a surprise trip from Silk Hope, NC just to be part of what is hopefully one of many of these living room concerts. He is hoping to stage one in his community. Lessons learned? Trying to start a charitable entity is hard work. You need a vision and if you are lucky some talent so to find a niche. But there is nothing wrong with simply raising money to help out wherever you see fit. All it really takes is time and passion. Being that I love music my eyes and ears are on alert for anyone who might be willing to share their talent. Thanks again to everyone who played any role in bringing this dream to life!